-Nor used for patients who are recommended to reduce sodium salt intake. 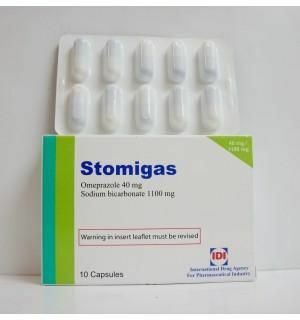 STOMIGAS (omeprazole/sodium bicarbonate) is indicated for short-term treatment of active duodenal ulcer. Most patients heal within four weeks. Some patients may require an additional four weeks of therapy. STOMIGAS is indicated for short-term treatment (4-8 weeks) of active benign gastric ulcer. STOMIGAS is indicated for the treatment of heartburn and other symptoms associated with GERD. STOMIGAS is indicated for the short-term treatment (4-8 weeks) ofcrosive cscphagitis which has been diagnosed by endoscopy. The efficacy of STOM1GAS used for longer than 8 weeks in these patients has not been established, If a patient does not respond to 8 weeks of treatment. it may be helpful to give up to an additional 4 weeks of treatment. If there is recurrence of erosive esophaguis or GERD symptoms (e.g .heartburn). additional 4-8 week courses of STOMIGAS may be considered. STOMIGAS is indicated to maintain healing of erosive esophagitis. Controlled studies do not extend beyond 12 months. STOMIGAS powder in packets for oral suspension 40 mgll680 mg is indicated for the reduction of risk of upper GI bleeding in critically ill patients. STMIGAS (omeprazole/sodium bicarbonate) is available as a capsule and as a powder in packets for oral suspension in 20 mg and 40 mg strengths of omeprazolc for adult use. Short-Term Treatment of Active Duodenal Ulcer: 20 mg Once daily for 4 weeks Benign Gastric Ulcer: 40 rng Once daily for 4·8 weeks. All recommended doses throughout the labcling are based upon omeprazole. Since both the 20 mg and 40 mg oral suspension packets contain the same amount of sodium bicarbonate (1680 mg). two packets of 20 mg are not equivalent to one packet of STOMIGAS 40 mg therefore. two 20 mg packets of STOMIGAS should not be substituted for one packet of STOMIGAS 40 mg. Since both the 20 mg and 40 mg capsules contain the same amount of sodium bicarbonate (1100 mg), two capsules of 20 mg are not equivalent to one capsule of STOMIGAS 40 mg: therefore, two 20 mg capsules of SmMIGAS should not be substituted for one capsule of STOM1GAS 40 mg.
STOMIGAS powder in packets for oral suspension. STOMIGAS Capsules should be swallowed intact with water. DO NOT USE OTHER LIQUIDS. DO NOT OPEN CAPSULE AND SPRINKLE CONTENTS INTO FOOD. Directions for use: Empty packet contents into a small cup containing 1-2 tablespoons of water. DO NOT USE OTHER LIQUIDS OR FOODS. Stir well and drink immediately. Refill cup with water and drink.lf STOMIGAS is to be administered tbroughn nasogastric (NG) or orogastric (OG) tube. the suspension should be constituted with approximately 20 mL of water. DO NOT USE OTHER LIQUIDS OR FOODS. Stir well and administer immediately. An appropriately-sized syringe should be used to instill the suspension in the tube. The suspension should be washed through the tube with 20 mLofwater. STOMIGAS 20/1 100 mg Capsules: Each hard gelatin capsule. contains 20 mg omeprazole and 1100 mg sodium bicarbonate. STOMIGAS 40/1100 mg Capsules: Each hard gelatin capsule. contains 40 mg omeprazote and 1100 mg sodium bicarbonate. STOMIGAS powder in packets for oral suspension is flnvored powder packaged in unit- dose packets. Each packet contains either 20 mg or 40 mg orncprazote and 1680 mg sodium bicarbonate. STOMIGAS is contraindicated in patients with known hypersensitivity to any components of the formulation, Hypersensitivity reactions may include anaphylaxis. anaphylactic shock. angioedcma, bronchospasm. interstitial nephritis. and urticaria. Not used for patients who are recommended to reduce sodium salt intake Caution should be taken in patients who complaining of hypertension, heart failure, renal disease, oedema and all cases that need salt restriction. Proton pump inhibitors arc not recommended to be taken regularly with patient using clopidogrcl, as they decrease the efficiency of clopidogrel, so it is advised to use both of them only in cases that need Proton pump inhibitors . Symptomatic response to therapy with omeprazole does not preclude the presence of gastric malignancy. Atrophic gastritis has been noted occasionally in gastric corpus biopsies from patients treated long-term with omeprazole. Each STOMIGAS Capsule contains 1100 mg (13 mEq) of sodium bicarbonate. The local content of sodium in each capsule is 304 mg.
Each packet of STOMIGAS Powder in packets for Oral Suspension contains 1680 mg (20 mEq) of sodium bicarbonate (equivalent to 460 mg of Na+), The sodium content of STOM1GAS products should be taken into consideration when administering to patients on a sodium restricted diet. Because STOMIGAS products contain sodium bicarbonate, they should be used with caution in patients with Banter’s syndrome. hypokalemia. bypocalcemia , and problems with acid-base balance. Long-term administration of bicarbonate with calcium or milk can cause milk-alkali syndrome. Chronic use of sodium bicarbonate may lead to systemic alkalosis and increased sodium intake can produce edema and weight increase. Several published observational studies suggest that proton pump inhibitor (PPI) therapy may be associated with an increased risk for osteoporosis-related Fractures of the hip, wrist, or spine. The risk of fracture was increased in patients who received high-dose. defined as multiple daily doses, and long-term PPlthcrapy (a year or longer). Patients should use the lowest dose and shortest duration of PPI therapy appropriate to the condition being treated. Patients at risk for osteoporosis-related fractures should be managed according to established treatment guidelines. -Prescription proton pump inhibitor (PP]) drugs may cause low scrum magnesium level ( hypomagncsemia) if taken for prolonged periods of time (in most cases, longer than one year), magnesium supplementation alone did not improve low serum magnesium levels and PPI had to be discontinues). The adverse reactions were reported to occur in I % or more of patients on therapy with omeprazole are the following: Headache. Diarrhea. Abdominal Pain. Nausea. URI. Dizziness. Vomiting. Rash. Constipation. Cough. Asthenia. Flatulence.Acid regurgitation and Back Pain. Chest pain or angina. tachycardia. bradycardia. palpitation. elevated blood pressure, and peripheral edema. Pancreatitis (some fatal). anorexia. irritable colon. flatulence. feeal discoloration. esoobageal candidiasis. mucosal atrophy of the tongue. dry mouth. stomatitis. During treatment with omeprezole. gastric fundic gland polyps have been noted rarely. These polyps are benign and appear to be reversible when treatment is discontinued. Gastroduodenal carcinoids have been reported in patients with Zollinger-Ellison syndrome on long-term treatment with omeprazole. This finding is believed to be a manifestation of the underlying condition. which is known to be associated with such tumors . Mild and. rarely, marked elevations of liver function tests fALl’ (SGP1). AST (SGOT) y-glutamyl transpeptidase. alkaline phosphatase. and bilirubin (jaundicej]. In rare instances. overt liver disease has occurred. including hepatocellular. cholestanc. or mixed hepatitis. liver necrosis (some fatal), hepatic failure (some fatal). and hepatic encephalopathy. Metabolic /nutritional effects: Hyponauernta. hypoglycemia. and weight gain. Psychic disturbances including depression, agitation, aggression, hallucinations. confusion. insomnia. nervousness. tremors. apathy, somnolence. anxiety. dream abnormalities: vertigo: paresrhesia. Respiratory effects: Epistaxis. pharyngeal pain. (some with rechallenge): skin inflammation. urticaria. angioedema .pruritus. photosensitivity. alopecia. dry skin, and hyperhidrosis. Special Senses: Tinnitus. taste perversion. Blurred vision. ocular irritation. dry eye s) ndrorne. optic atrophy. anterior ischemic optic neuropathy, optic neuritis and double vision. Interstitial nephritis (some with positive rechalJenge). urinary tract infection, urinary frequency. elevated serum creatinine. proteinuria. hematuria. glycosuria. testicular pain. and gynecomastia. Rare instances of pancytopenia. agranulocytosis (some fatal), thrombocytopenia. neutropenia. leukopenia. anemte.Jeucccytosts. and hemolytic anemia have been reported. Additional adverse reactions that could be caused by sodium bicarbonate include metabolic alkalosis. seizures. and tetany. Increases in INR and prothrombin time may lead to abnormal bleeding and even death. Patients treated with proton pump inhibitors and warfarin may need to be monitored for increases in lNR and prothrombin time. Although in normal subjects no interaction with theophylline or propranolol was found. there have been clinical reports of interaction with other drugs metabolized via the cytochrome P-450 system (e.g., cyclosporine, disulfiram, bcnzodiazepines). Patients should be monitored to determine if it is necessary to adjust the dosage of these drugs when takenconcomitantly with STOMIGAS. increased by the concomitant administration of ctartthrornyctn. Clarithromycin concentrations in the gastric tissue and mucus were also increased by concomitant administration of omeprazole. Concomitant administration of omeprazole and tacrolimus may increase the serum levels of tacrolimus. There are no adequate and well-controlled studies on the use of omeprazole in pregnant women. Because omeprazote is excreted in human milk. because of the potential for serious adverse reactions in nursing infants from omeprazolc. and because of the potential for tumorigenicity shown for omeprazole in rat carcinogenicity studies. a decision should be made to discontinue nursing or 10 discontinue the drug. taking into account the importance of the drug to the mother. In addition. sodium bicarbonate should be used with caution in nursing mothers. Safety and effectiveness of STOMIGAS have not been established in pediatric patients less than 18 years of age. There were no differences in safety and effectiveness between the elderly and younger subjects. Consider dose reduction, particularly for maintenance of healing of erosive esophagitis. No dose reduction is necessary. Orneprazole belongs to a class of amisecretory compounds. the substituted benzimidazoles. that do not exhibit anticholinergic or H2 histamine antagonistic properties. but that suppress gastric acid secretion by specific inhibition of the H+/K+ATPaseenzyme system at the secretory surface of the gastric parietal cell. Because this enzyme system is regarded as the acid (proton) pump within the gastric mucosa, omeprazole has been characterized as a gastric acid-pump inhibitor. in that it blocks the final step of acid production. This effect is dose related and leads to inhibition of both basal and stimulated acid secretion irrespective of the stimulus. Animal studies indicate that after rapid disappearance from plasma. omeprazole can be found within the gastric mucosa for a day or more. Omeprazole is acid labile and thus rapidly degraded by gastric acid. STOMrGAS Capsules and powder in packets for oral suspension arc immediate-release formulations that contain sodium bicarbonate which raises the gastric pH and thus protects omcprazo!c from acid degradation. Antlsecretory Activity The antisecretory effect lasts longer than would be expected from the very short (I hour) plasma half-life. apparently due to irreversible binding to the parietal H+/K+ ATPase enzyme. The incidence of ECL cell hyperplasia is increased with time; however, no case of ECL cell carcinoids, dysplasia, or neoplasia has been found in these patients. Other Effects when intragastric pH is maintained at 4.0 or above. basal pepsin output is low. and pepsin activity is decreased. As do other agents that elevate intragastric pH , omeprazote administration produced a significant increase in the intragastric concentrations of viable bacteria. The pattern of the bacterial species was unchanged from that commonly found in saliva. All changes resolved within three days of stopping treatment. when STOMIGAS Oral Suspension and Capsules are administered on an empty stomach 1 hour prior to a meal. the absorption of omeprazole is rapid and time to peak of approximately 30 minutes (range 10=90 min) after a single-dose or repeated-dose administration. Absolute bicavailability of STOMIGAS Powder in packets for Oral Suspension (compared to I.V. 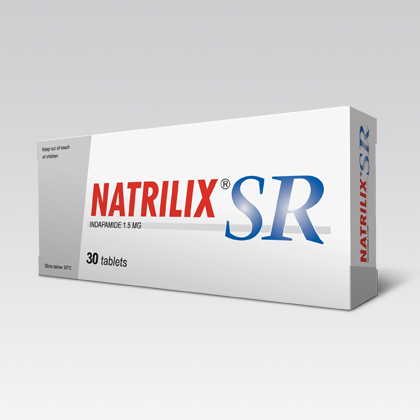 administration) is about 3040% at doses of 20 – 40 mg, due in large part to presysternic metabolism. The bioavailability ofomeprazole from STOMIGAS increases upon repeated administration. When STOMIGAS is administered I hour after a meal. the omeprazole AUC is reduced by approximately 24% relative to administration I hour prior to a meal. Omeprazole is bound to plasma proteins. Protein binding is approximately 95%. derivatives of omeprazote. and hydroxyomeprezole. These metabolites have very little or no antisecretory activity. Following single-dose oral administration of omeprazole. little if any, unchanged drug is excreted in urine. The mean plasma omeprazole half-life in healthy subjects is approximately 1 hour (range 0.4 to 32 hours) and the total body clearance is 500-600 mUmin. The elimination rate of omeprazole was somewhat decreased in the elderly. and bioavailability was increased. The pharmacokinetics ofSTOMIGAS has not been studied in patients < 18 years of age. There are no known differences in the absorption or excretion of omeprazole between males and females. In patients with chronic hepatic disease, the bicavailability of omeprazole from a buffered solution increased to approximately 100% compared to an I.V. dose, reflecting decreased first pass effect, and the mean plasma half-life of the drug increased 10 nearly 3 hours compared to the mean half-life of I hour in normal subjects. Plasma clearance averaged 70 mUmin, compared to a value of 500-600 mUmin in normal subjects. Dose reduction. particularly where maintenance of healing of erosive esophagiris is indicated, for the hepatically impaired should be considered. in proportion to the decreased creatinine clearance. No dose reduction is necessary in patients with renal impairment. In phannacokinetic studies of single 20-mg omeprazolc doses, an increase in AUC of approximately four-fold was noted in Asian subjects compared to Caucasians. Dose adjustment. particularly where maintenance of healing of erosive esophagitis is indicated. for Asian subjects should be considered. Pharmaceutical industries CO. (EIPICO) for international drug agency for pharmaceutical industry.